FREE ESTIMATE. To buy, auction, sell or consign your Leo Tolstoy autograph that is for sale, please email Nate@NateDSanders.com or call the Nate D. Sanders Auction House (http://www.NateDSanders.com) office at (310) 440-2982. Leo Tolstoy was a Russian novelist and playwright who is well known for his classic novels War and Peace and Anna Karenina. Tolstoy also authored books with an autobiographical component such as the trilogy Childhood, Boyhood, and Youth. He became immersed in nonviolent resistance during his later years, which are conveyed in The Kingdom of God is Within You. Tolstoy’s nonviolent ideas widely influenced world peace leaders such as Gandhi and Martin Luther King Jr. Some of Tolstoy’s great works have been adapted into very successful films, such as the 1956 epic War and Peace starring Audrey Hepburn. We sold a Leo Tolstoy autograph at auction for $3,500. Please see the lot details below. Very rare autograph by the Russian literary genius, Leo Tolstoy. 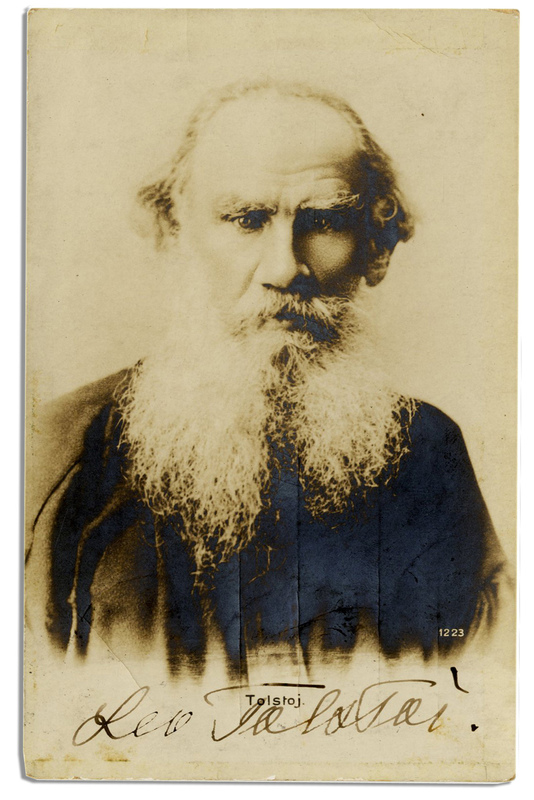 Tolstoy signs his name, “Leo Tolstoi” below his image on a striking postcard capturing the writer as an elderly man. The card verso is postmarked in Russian for 1909, one year before his death. The recipient is a Herrn Richard Stern in Vienna, Austria. Postcard measures 3.5″ x 5.5″ with some silvering to photo and slight wear to the edges. Very good condition. Scarce. With PSA/DNA COA. Sold for $3,500. Scarce Leo Tolstoy Autograph on Signed Vintage Photo Postcard. Click to enlarge. 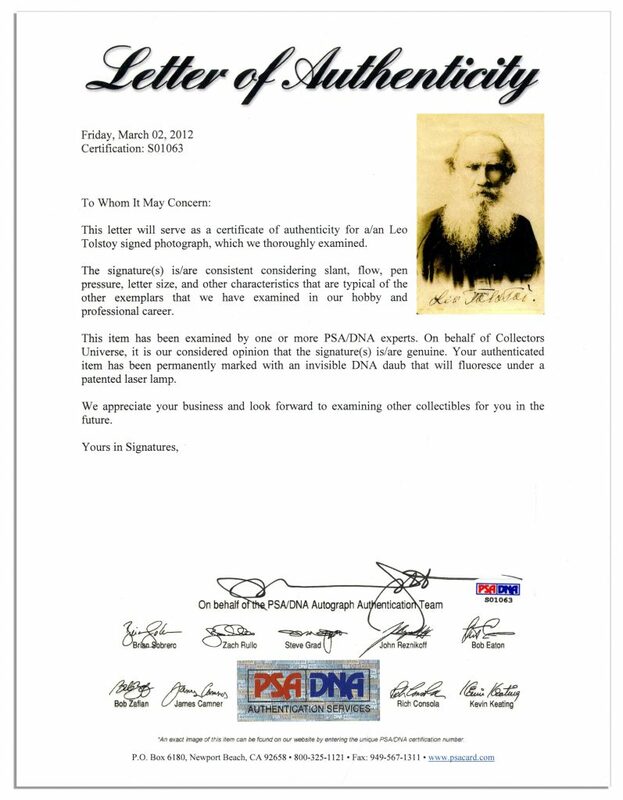 PSA/DNA COA for Leo Tolstoy Signed Vintage Photo Postcard. Click to enlarge.